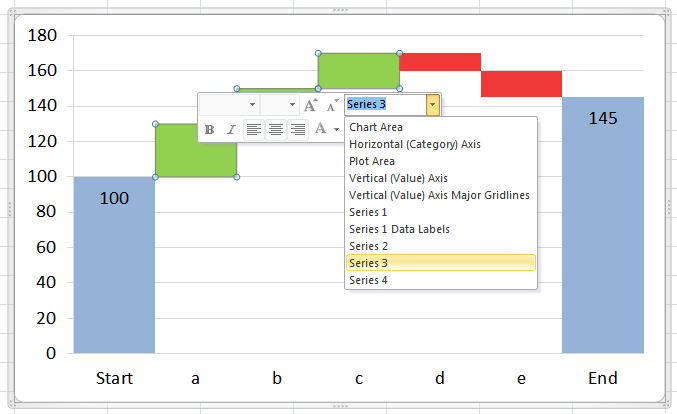 I’m working on a series of posts about charting in Dynamics CRM at the moment. Some are longer articles with fully worked examples of how to achieve common scenarios my clients request, or that I see people asking about in the Dynamics Community and other forums. Others will be shorter pieces with quick tips or documenting some of the little quirks of the chart production process. I could not start to publish these articles in good conscience without first acknowledging where I learned my charting skills over the years, especially figuring out how to do things that at first seem impossible “out of the box”. 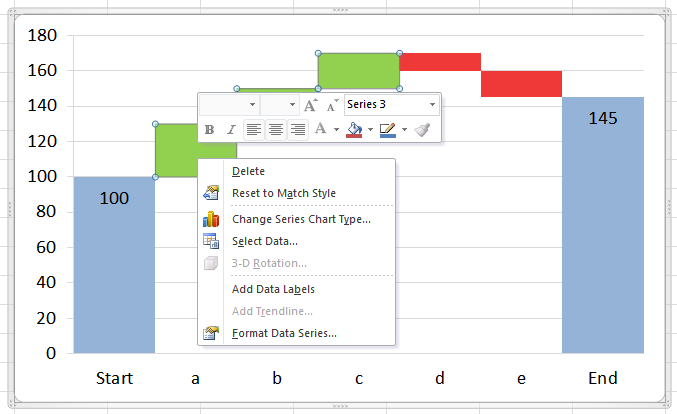 Almost everything I ever learned about how to fool Microsoft software into displaying charts that seem impossible to create, I learned from MVP Jon Peltier and his excellent Excel blog at Peltiertech.com. His step-by-step examples of how to produce practical advanced charts are really easy to follow and get straight to some really great results. All of his advanced charts are also great examples of applied best practices in visualisation design. More than anything, I have learned from Jon’s approach to tackling chart problems by breaking them down into things that the chart engine can do (whether Excel or CRM), and then using interim calculations or whatever else is needed to build the “impossible” desired result. In particular, Jon takes a firm stand against ever drawing anything on a chart, (such as a target or threshold line) or changing the colour of a data point by hand, or selectively adding labels. You should always try to build a chart that works today, and then produces exactly the same effect with more or different data, automatically and without needing to be “tweaked”. This stance is invaluable when dealing with the CRM chart rendering engine, where you cannot “hand tint” things after the fact – all your work needs to go into the way the chart is built in the first place. I still use (and teach) many principles I first learned in the last ten years of reading Jon’s work, and I am sure I will continue to learn much more from him. Definitely top of my list for a reason. I also want to signpost the fantastic CRM Chart Guy blog by Ulrik Carlsson. His articles show great walk-throughs of mini projects to create more advanced charts for Dynamics CRM, as well as providing lots of references for the ChartXML syntax which is (in my opinion at least) fairly poorly documented. I often point people to CRM Chart Guy posts in response to questions in forums, as well as using it as my own go-to reference for things like syntax for options I use less frequently. What I like most about Ulrik’s style of articles is that he often shows the intermediate stages, when a chart looks completely wrong. This gives reassurance to the reader hat if yours looks like this, it is right, not wrong, and that it will all come together in the end. Combined with lots of downloadable XML ready to use, practical real-world examples, and detailed reference lists this is another showcase of skill and good practice. If your focus is on charting in CRM rather than other tools, this should be top of your bookmarks and RSS feed, or you can follow the CRM Chart Guy for updates. Stephen Few is a very well-known figure in the field of data visualisation, as a consultant, author of multiple books, MBA professor, international speaker and educator and inventor of the bullet graph. Stephen’s area of expertise is data visualisation as a science in itself (with a bit of art thrown in), blending cognitive psychology and practical experience in a completely results-oriented way. Not focussing on any particular software, or tool, or technology (although he has experience of many of these), but rather on what you should be doing with those tools to achieve useful results. I was fortunate enough to be able to attend a three-day workshop taught by Stephen in London a few years ago, each day based around his (then) three main books. His down-to-earth conversational style made for a great learning experience, and the shared ideas from all the participants added even more. If you are serious about developing your skills as a “data sense maker”, then you really should try to get on one of Stephen Few’s courses. If you cant get to an in-person workshop, his books are a great alternative source of information. What I found most interesting about Show Me the Numbers was that this dealt not only with charts, but also with tables, which are often given almost no consideration by comparison. I did sometimes feel that much of what I read in this book was really obvious – but only once it had been pointed out. i still apply many of the principles I learned from this book in my daily data visualisation work, now almost without thinking about it. Information Dashboard Design is also a very valuable reference – much of the book deals with highlighting bad practices to avoid and better alternatives to use. This is particularly valuable “ammunition” to have when trying to turn around existing dashboard designs that have become entrenched and embedded in an organisation, in order to help enlighten people and show them a brighter future. Both of these first two books are on on their second editions, with additional content to reflect changing usage patterns, particularly in areas such as interactive displays (where tooltips can reduce labels and chart junk for example) and mobile content (especially for live dashboards). I don’t use his third book Now You See It quite as much, dealing as it does with deeper data analysis and exploration, which are areas that don’t come up quite as often in my day-to-day work with clients. Stephen Few is often mentioned in the same breath as Edward Tufte, and although I have read much of Tufte’s work and taken some useful ideas from it, I find their styles very different. I find Tufte can sometimes be very prescriptive, and a little bit too “academic” in his aesthetic goal of minimalist purity. Stephen, on the other hand, applies the same scientific knowledge of how we process visual information to practical problems. His tone tends towards that of a trusted advisor rather than of a strict parent. As an example of the difference in approach, I am sure that both of them would agree that you should try to improve the data:ink ratio (a term coined by Tufte) by reducing clutter on charts. I feel that Edward Tufte would argue this almost as a goal in itself, whereas Stephen Few would do this only insofar as it helps to achieve better results. Having said that, Tufte has made many very valuable contributions to the field of practical data visualisation, including promoting and giving a name to sparklines, which have become very popular for dense data-rich displays. As I write this, I find myself wanting to refer to them as “Tufte” and “Stephen” – perhaps this is a reflection of the difference between formality and approachableness that I sense in their writing styles. I could not possibly mention everyone whose blog I follow, books I have read or tweets that signpost great content on a daily basis. So I have put together a twitter list of data visualisation experts who share useful information on a regular basis about all aspects of making better sense of data, business intelligence, chart and dashboard design, the cognitive psychology aspects of data visualisation, or ways to use the tools we have available to us. Who have you learned most from about data visualisation and charting? What are your go-to resources when you need to figure out a better way to display your data? Share your thoughts in the comments, please! I just discovered a minor enhancement to chart controls in Excel 2010 that makes a really big difference in terms of how long it takes to quickly add the formatting I need. On the right hand end of this you can see the selected element (Series 3 in this case) which you can then directly format, but even more usefully, you can use the drop down here to select another element, format that, then another and so on, and the mini-bar stays on top throughout.